A specialty blend of apple varieties from Oregon and Washington. The first 3 batches made from Newtown Pippin and Winesap from Heirloom Orchards in Hood River, Oregon. 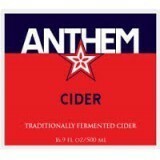 Apples we ferment will fluctuate seasonally and lend variations in Anthem’s flavor profile from batch to batch. The apple varieties used and their contribution to the flavor profile will be listed on our website and on each keg by the batch.